What Remains of Edith Finch is free this month from the Epic store. I downloaded it last night and couldn't stop playing until I was done. It's a detailed, polished walking simulator that clocks in at 3 hours, so tightly orchestrated it feels like a genuinely interactive movie. It centers on Edith, a high schooler and the last surviving child of a family "cursed" by generations of tragedy. After her mother's death, she inherits the cosy yet unsettling manse she grew up in and sets out to uncover the family's secrets. She wants to know why so many Finches died young and why her mother didn't want the stories told. It's obvious from the outset that something is deeply wrong with the family even as it is clearly a family full of love. The wrongness hovers at the margins of reason. It's reflected in the house, normal at the ground level but an alarming mass of ramshackle additions up top. Surely that would be dangerous, you ask yourself. Some of the family death vignettes really got under my skin. They're all elaborated in the telling to the point of magic realism and beyond, but when you sit and think about what happened they unravel to mundane parenting failures, one after another after another. The elaborations thereby become part of the problem. But now I'm in danger of spoiling the game's secrets. 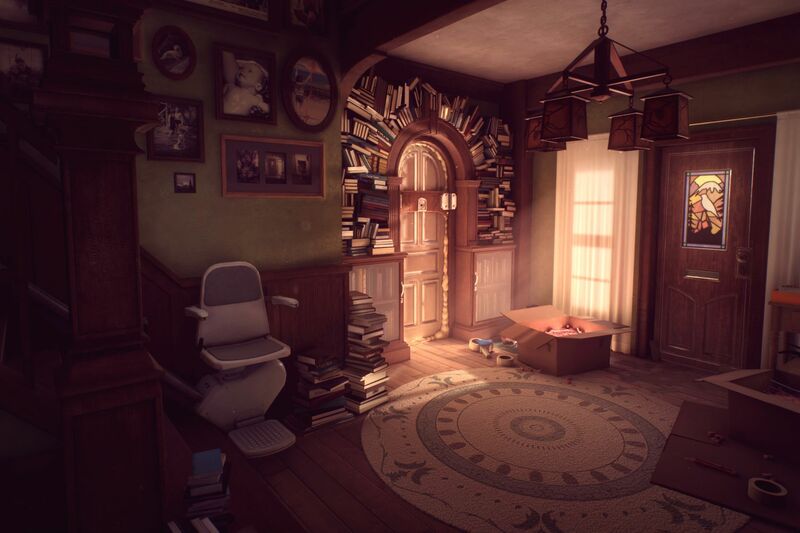 Edith Finch maintains a tension between modern gothic mystery and the suggestion of a damaged family that mythologizes its subtly self-destructive currents. It does such a good job of this, though, that when the ending comes it can't close the balance, choosing instead a too-easy way out. Still, that's often just how it goes, with families that aren't quite right.